So, I arrived in Toronto to spend some excellent quality time with Jamie’s family and had a great few days. We went to the gym (once…), ate leftovers and terrible treats and most importantly, spent time laughing and being silly together. Jamie and I were planning on driving back to Kingston on Saturday to continue Christmasing, after Jamie’s uncle Phil had left. Come Saturday, my poor Mom and Dad called to say they were both very sick with a gross flu that EVERYONE IN THE UNIVERSE HAS. Jamie was also sick with the cursed disease, so we hunkered down to spend some intense lazy, restful flu-cure time inside. I made it my mission to cure him of his ailments (and I was pretty happy to be doing nothing I have to say) and we had a great day of Upstairs, Downstairs (the new one), movies, ham and eggs, leftover turkey, and chocolate chip pancakes and bacon for dinner. It was actually the best. Unfortunately, I woke up today with the exact same symptoms everyone else had before they were launched into flu time city, so although I feel OK now, I worry it’s only a matter of time before the thing takes me down. So this pause in Holiday momentum has caused my brain to think that Christmasing is over, when in fact, it will start again once we get to Kingston on Monday. So I’m considering this weird limbo my Christmas hiatus. During this hiatus of nesting and snuggling in blankets and tea, I also spent some time thinking about the current state of my apartment decor and how pretty it is now with all the Christmas decorations. Come January, I’ll have to put all the Christmas away and go back to real life, which makes me sad and in the market for ways to spruce. 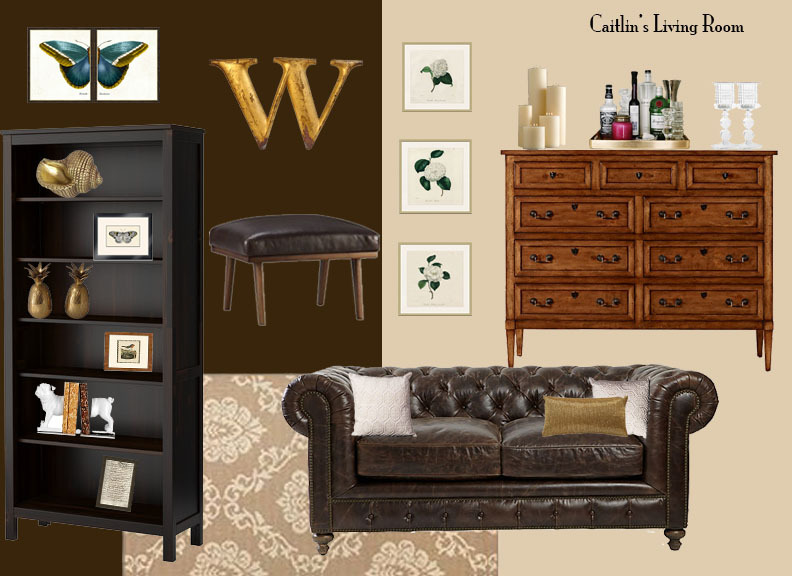 I started putting together a design board for my Living room, beginning with the elements I already have and know I won’t be losing any time soon: Brown couch (although less fancy than the one on my board), brown and beige walls, exact rug, exact bookshelves, brown dresser thing and ottoman. After I stuck in the basics, I started adding little accents that I know I either already have or can get for cheap. All of a sudden, I had this cool little design board which I’ve shared with you today, because for unknown reasons, I took absolutely no pictures in the last 4 days. I can’t believe I didn’t even document the chocolate chip pancake dinner. I am ashamed. Forgetting to take bloggy photos! Throat burn, sniffle nose. The recent days of extreme laziness have been amazing, despite my getting ill. Even if I don’t end up realizing my little design board dreams, I had so much fun making it, I’m going to do the same thing for my other rooms! Going to Kingston tomorrow for continued family time and New Year’s Eve shenanigans (hopefully neither of us will be too ill for shenanigans)! Every train at Christmas is The Polar Express. Love your design board! very chic!